We are giving you a promotional event as a longevity god same month. The longevity god will be requested to provide his/her identification documents to prove his/her qualifications claimed. 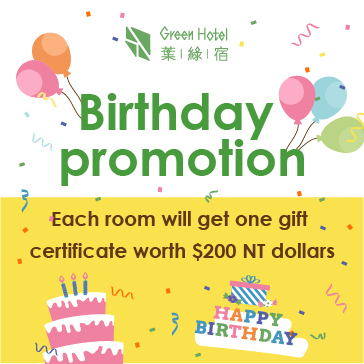 Each room will get one gift certificate worth 200 NT dollars. The room types are limited and subject to this project only. Holidays and consecutive holidays are not included. Green Hotel retains the right to modify the project. If there are other needs, please contact us. Daily limited one room per types. The quantity is limited, sold till supplies last.